Having a properly built fireplace is essential to ensure proper smoke ventilation when having a fire in your home. We are Michigan fireplace experts who specialize in the building of fireplaces, fireplace re-facing, and fireplace repair for years in Oakland County, MI. 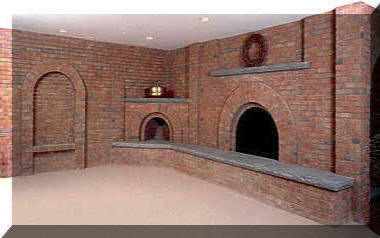 We can help you create a warming environment with our properly constructed masonry fireplaces. During Michigan’s cold winters having a fireplace that is built correctly is critical. 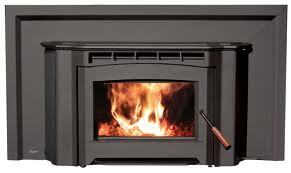 We can supply a specialized fireplace contractor for your fireplace needs. Need a Michigan fireplace insert? 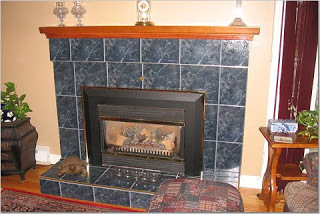 We can supply a specialized fireplace contractor for your Michigan fireplace insert. We are always working to be the Michigan fireplace company. Michigan fireplace Is a local fireplace chimney and masonry contractor serving wayne county, Novi, Northville , canton, Plymouth Madison Heights Mi. 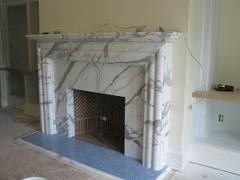 Michigan fireplace has years of experience specializing in masonry restoration and repair. Our chimney sweeps can inspect your brick chimney fireplace and our chimney sweeps can provide you with your annual chimney cleaning or chimney repair We are experts at matching brick and mortar color. We are not a handyman service, aim to northvillr, Plymouth, and cantons leading brick fireplace chimney cleaning and chimney repair company. Michigan fireplace is a group of fireplace masonry craftsmen devoted to chimney repair Masonry restoration and quality brickwork. Highland Township White lake and Waterford. As the years have gone by we have grown to support the grounding cities such as Grand Blanc, Madison Heights & Rose Township. We have a real sense of satifaction knowing that if we are in Livonia, West Bloomfield or even Detroit a satisfied chimney repair customer is never far away..
Let us help you repair and restore your homes masonry beauty. Michigan leading chimney cleaning, chimney repair, and historic brick repair company. We have worked hard to earn a reputation for quality and look forward to showing the residents of Madison Heights Mi that it is well deserved. Our goal is to leave every customer satisfied and willing to use us again, or recommend us to a friend. We pride ourselves on building corners not cutting them. Our Masonry contractors and chimney sweeps offer free chimney repair estimates to all Madison Heights , Holly, Grand Blanc Rose Township, and Lindon residents for any of the following services: chimney cleaning, chimney repair, masonry construction, chimney crown repairs, chimney cap replacement, chimney rebuilds, tuckpointing, natural stone, limestone replacement, cultured stone, brick porch repair, Brick porch construction, masonry wall construction, brick wall repair, brick replacement, tuck-pointing, pointing and re pointing work, grout replacement, and historic restoration. We look forward to the opportunity to help you with your masonry construction and chimney cleaning projects. Fireplace issues & fireplaces do not work, how to make your chimney draft properly and how to build a chimney and fireplace that draft properly are a common topic of discussion among bricklayers and masonry contractors. Since man first discovered fire and dug the first fire pit all the way up tiill huge chimney stacks and furnaces suplied heat to industrial plants and homes having your fireplace burn properly has been the problem hand. The prices of building a brick or stone fireplaces and chimney has steadily grown as knowledge of brick stone and masonry has increased. During these modern times we have the advantage of learning from our fore fathers and developing formulas and techniques to combat draft and increase fireplace and chimney efficiency. Still today we find that some fireplace chimney's work better than others. The main principle of why a chimney or fireplace works because heat rises. When you start a fire, in your fireplace the air inside chimney warms and begins to rise .The heat of the fire in your fir box draws in the cooler air from the room it is in. This cooler air flows into the firebox fanning the fire increasing the flame in an ongoing cycle. The heat dynamic created pressure differentials can also create a pleasant breeze as it moves across the top of your chimney. There are numerous reasons a chimney and fireplace may not function properly. Will start with the the most simple & obvious solutions Please bear in mind this list may not solve all of your fireplace and chimney issues but it should provide you a good place to start. Here is a list of common reasons that fireplaces and chimneys don't work . 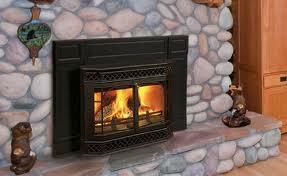 To really understand fireplaces chimney sweeping and chimney's requires extensive knowledge masonry and fireplaces. Being a chimney sweep does not mean you a qualified to do chimney repair. Likewise being good at masonry and brick work does not make you good with chimneys. When dealing with your chimney repair and chimney problems you want a contractor familiar chimney building codes, pressure differentials, and actual fireplace construction techniques. If the information provided here does not help you solve the problem with your fireplace, consider hiring an experienced, chimney sweep and masonry restoration expert in your area. The problem may be obvious to someone with chimney and fireplace experience once they can actually look over the fireplace and chimney..
Unfortunetly chimney fires are a reality of life They destroy thousands of homes and lives. Having a regular chimney cleaning by your local chimney sweep can prevent most chimney fires. If proper precautions are taken, brick fireplace chimney fires can be avoided. A Chimney should be inspected by a chimney sweep and chimney cleaning specialist regularly. 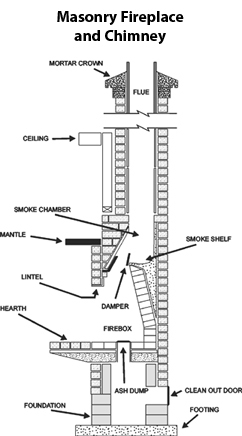 First, you need to understand the anatomy of how a fireplace works and how a fireplace chimney fire is set into motion. When a fire is built in a masonry or brick chimney it is started in the fireplace fire box. The chimney firebox is built out of fire brick. A fire brick, firebrick, or refractory brick is a block of refractory ceramic material used in lining furnaces, kilns, fireboxes, and fireplaces. A fireplace fire box is primarily to withstand high temperature, but will also usually have a low thermal conductivity for greater energy efficiency. Fireplace firebrick are weaker, but they are much lighter, and insulate far better than dense bricks. A brick fireplace brick fire box should be free from cracks. The fireplace fire brick will taper in toward a damper and smoke shelf. A fireplace firebox is the only spot in which burning wood should occur. Everybody knows where there is chimney smoke there is fire, so obviously when you burn wood in your masonry and brick fireplace chimney, smoke is released and travels up from your fire box and into a smoke shelf and chimney flue liner. As the warm smoke travels up the chimney flue liner it begins to cool . That smoke condenses on the inside walls of your chimney flue liner and is converted into creosote. Creosote is a highly flammable material that ignites easily from flame or spark. The type of wood that is burned in a brick chimney fireplace and frequency of chimney cleaning affects the amount of creosote built up on the chimney flue liner. Green, or unseasoned wood, contains a lot of moisture. This means it takes more heat to burn the wood in the brick fireplace firebox. Green wood produces more creosote. Outside temperature also plays a factor in the amount of creosote formed. Chimneys that run up the side of your brick house are more apt to produce creosote. than one that runs up the center of your home This is because brick concrete and stone masonry has a low insulation value. The warm smoke being hit by cool temperatures condenses more quickly. Proper air flow is critical to your stone or brick chimney. Making sure your fireplace damper is open all the way so that smoke ventilates through the chimney quickly also reduces the risk of creosote forming. A Fireplace chimney must be built to a proper height to draft properly. Usually three feet above the roof or ten feet from the roof. You must make sure to have a chimney cleaning profession or chimney sweep clean your chimney annually. When you ignite paper or cardboard in your fireplace, often times small flaming pieces of ash and soot can drift up the flue liner and are more likely to ignite the creosote that has built up.